Supermassive black holes at the heart of merging galaxies will circle closer and closer until they come together, releasing a titanic wave of energy. The process may help explain how black holes get so huge to begin with. Julie Comerford has built a career searching for galaxies that contain not one, but two supermassive black holes — light-devouring monsters that have masses millions or billions of times that of the sun. So far, the count is up to 12. "The mergers of two supermassive black holes is second only to the Big Bang as the most energetic phenomena in the universe," Comerford, an astrophysicist at the University of Colorado, Boulder, told Space.com. Yet that titanic, violent dance — essential to galaxy growth and evolution — has not been spotted very often. Relatively small "stellar mass" black holes form when a huge star dies in a supernova explosion and its core collapses. A black hole can grow as more mass falls into it, but nobody can fully explain how the supermassive ones lurking at the cores of galaxies are able to get so enormous — the one at the center of the Milky Way has a mass 4 million times that of the sun, and it's comparatively small. The process of two galaxies merging could explain this extraordinary growth. "One theory is that maybe a lot of the black hole mass growth actually occurs during galaxy mergers, because that's when all this gas is being slammed together and funneled towards a black hole — so there's a lot of fuel available for the black hole to eat and build up its mass," Comerford said. Solving the growth mystery promises to reveal insight into how galaxies, and the black holes at their hearts, grow and change over time. Plus, it should help hone scientists' newly proven powers of detecting gravitational waves. The ultralarge black holes at the centers of galaxies don't let any light slip out, but pairs of structures so massive leave their mark on the environment around them in other ways. For one thing, they're always at the hearts of merging galaxies. "The Milky Way just has one central big sphere of stars, so it would not be a good candidate for one of these potential double black holes," Comerford said. "We're looking for things that look different from the usual galaxies that you see images of, like a normal spiral galaxy or elliptical galaxy — that's not what we want. [We want] the ones that look like they're two merging spheres of stars." That merging process also puts a lot of extra material in the path of each of the black holes, which can gain whirling "accretion disks" of dust around them that glow brightly andemit jets of energy. Supermassive black holes with that kind of ultrabright beacon are called quasars, and they're far from invisible — in fact, they often outshine the galaxies that surround them. Comerford first started searching for these double-black-hole galaxies when she was in graduate school. Her group first recognized the black holes by the unusual spectrum of light their host galaxies emit, as measured in big survey studies like the Sloan Digital Sky Survey. Galaxies with a quasar at their center — a supermassive black hole taking in large quantities of material — emit a narrow band of radiation that's very bright. But the galaxies Comerford was looking for were more complex: Instead of a nice, tall peak indicating the intense glow emitted by the quasar, she saw two peaks — one slightly redder and one slightly bluer. Comerford's systematic search could find supermassive black holes that are around 3,000 light-years away from each other — that's about 1/8 the distance from Earth's solar system to the center of the galaxy — and that are orbiting one another at about 500,000 mph (800,000 kph). Looking straight at such systems, it might be impossible to distinguish the two quasars from each other because they'd be too close together, so the wavelengths of light emitted provided a crucial first clue. More recently, because of the increasing amount of Hubble galaxy imagery available, Comerford has started relying on visual images to pinpoint the supermassive black hole pairs. First, she finds quasar activity in telescope data, and then she checks with a Hubble image of the galaxy to see if it looks like it might be two merging galaxies, with two tight cores of stars that might each surround a supermassive black hole. Finally, she follows up with higher-resolution infrared or radio telescopes to try and distinguish whether there are two separate quasars there. Diagrams of 30 merging galaxies. The edges show signal strength from carbon monoxide, while colors show where the gas is moving. Red represents gas moving away from Earth, and blue moving towards. "There may be one [supermassive black hole pair] in every something like a thousand to a million galaxies," Sarah Spolaor, a researcher at the National Radio Astronomy Observatory in New Mexico, told Space.com. "The chance of just finding one by chance is pretty low, but if you have a sky catalog of thousands upon thousands of galaxies, then you're much more likely to see that kind of weird-looking one that you think, 'What is that?' — and it's maybe a binary black hole." Researchers know that supermassive black holes are intimately tied to the galaxies surrounding them. There's one at every galaxy's heart, and the galaxy's size is reflected in the size of the black hole. Even early galaxies, born close to the beginning of the universe, show that correlation. Finding black hole mergers can help solve the mystery of how those black holes got so big, so early in the universe's history. Plus, even the existence of quasars at all, which can only form once black holes get massive enough, raises questions. "Why are we doing this stamp collecting?" Comerford said. "There's scientific questions that we want to answer, and that is one of the big ones: how do black holes get enough gas in the first place to become a quasar?" Researchers know that black holes at the center of merging galaxies ultimately form into one larger supermassive black hole, but it's unclear whether that's the whole picture. 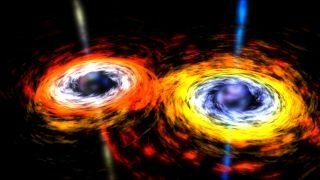 "Galaxy mergers are definitely an effective way to get supermassive black holes to grow," said Scott Barrows, an astronomer also at the University of Colorado, Boulder. "But how important is this process relative to other processes that could just be happening in a galaxy that's not interacting?" Barrows said. "There's not a good consensus on how this works as of yet," he told Space.com. Besides solving that mystery, a better understanding of the epic systems should reveal more about the overall universe's evolution, researchers say. "Supermassive black holes are thought to play a huge role in how the universe evolves," Spolaor said. "They are the most massive compact single objects in the universe." When two black holes finally merge, they set off an intense clap of energy that should be released as gravitational waves — ripples in space-time that are caused by superenergetic events. Gravitational waves were measured for the first time in February, and were traced back to the merging of two small black holes, each of which contained about 30 times the mass of the sun. Supermassive black hole mergers should give off a much more powerful signal. This artist’s illustration shows gravitational waves created by two merging black holes. Spolaor uses supersensitive radio telescopes to hunt for double black hole systems as part of her research into pulsar timing, a process that measures tiny changes to certain celestial bodies to detect gravitational waves moving through space. Knowing where double black hole systems are, and physical properties about the circling giants, can help her narrow down what types of gravitational wave signals to search for from the systems. Scientists have already found one invisible interaction with gravitational waves, and one day, gravitational wave measurements will point out many of the universe's wildest interactions. But for now, it's up to researchers to interpret what light makes it over from those powerful, chaotic systems. "When something like Hubble is observing one of my galaxies, I like to look up where the orbit of Hubble is," Comerford said. "I like to find out when it's passing overhead, where I am. So I go outside, and I look at Hubble while it's looking at one of my galaxies — that's how I commune with it. But then, I have to be patient and wait until at least the next day to see what the data actually looks like."